This ancient name is of Old French origin, introduced into England by the Normans after the Conquest of 1066, and is an occupational surname for a clerk or keeper of records in Latin. 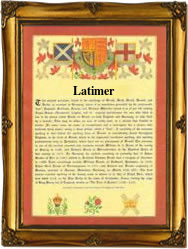 The name derives from the Old French (and later Anglo-Norman French) "latinier", latim(m)ier", interpreter, literally "a speaker of Latin", ultimately from the Latin "latimarus, latinarius". A late medieval English dictionary, the "Promptorium arvulorum", defines a "latonere", as ... "he that usythe Latyn speche". During the Middle Ages Latin was effectively the only language used for official documents, and the position of "Latiner" or "Latimer" was therefore a skilled and important one. Latin was displaced in England only gradually by the vernacular, firstly Anglo-Norman French, and eventually English. The surname is recorded in the Domesday Book of 1086 in its Latinized form: Ralph Latimarus (Essex), and Hugo Latinarius, Interpres (Hampshire). A notable bearer of the name was Hugh Latimer (1485 - 1555), the Protestant bishop; he was burnt at the stake for heresy under "Bloody" Mary 1 of England. An early example of the name from London Church Registers is that of the christening of Josua Latimer at St. Lawrence Pountney, on July 24th 1548. A Coat of Arms granted to a family of the name in the reign of Edward 1st (1272 - 1307) depicts, on a red shield, four black escallops on a gold cross patonce. The first recorded spelling of the family name is shown to be that of Gocelinus le Latimer, which was dated 1102, in the "Chartulary of the Monastery of Ramsey", Cambridgeshire, during the reign of King Henry 1, known as "The Lion of Justice", 1100 - 1135. Surnames became necessary when governments introduced personal taxation. In England this was known as Poll Tax. Throughout the centuries, surnames in every country have continued to "develop" often leading to astonishing variants of the original spelling.